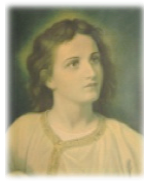 back in the 2nd century, there lived a beautiful young girl named Cecilia. In those days, most people were pagans, accepting the false gods of the Empire. But Cecilia was a Catholic, and not only that, she had secretly consecrated her virginity to Christ, desiring to live only for him. But through the course of events, she was arrested, and ordered to give up her Catholic Faith. She refused, and was given the sentence of death. Seeing this beautiful girl’s courage, over 400 persons that day, decided to become Catholic. So the authorities went to Cecilia’s home, and there they locked her inside of a steam room, and turned up the heat to suffocate her; but she called out to them saying, ‘it’s cool in here!’ They therefore decreed that she would be beheaded. So there, in her own home, an executioner three times tried to decapitate her with his sword, but he could not get her head cut all the way off. Cecilia lived for three more days, all the time urging those around her to be faithful to Christ; at the end of three days she fell asleep in the Lord, and the Pope made her house into a Church, which it is to this very day. Friends in Christ, The martyrs endured many challenges, yet they remained faithful to the Catholic Faith, faithful to Jesus. In this they possessed great courage. Courage is a virtue that everyone of us should seek; we need courage not only if we are one day called to be a martyr, but if we really think about it, we need courage almost every day, because things come up which make us fearful, or nervous, but we need to overcome our fears, with courage. Many things can cause us fear: we can be afraid of pain, of getting hurt, or from a medical procedure; little children can be afraid of the dark, or of bad dreams, of dogs, or thunderstorms. Some people fear loneliness or being abandoned. Young people might fear auditioning for a play, fear of failure, or fear of tests. Others feel afraid to talk to their parents about a personal problem; young couples can be afraid of commitment, afraid of the unknown. There are many things, even in one day, that can cause us fear. But every fear is a signal to us for courage. Fear makes us want to push away from some threat, from something difficult. Courage comes from the hope that we can overcome the threat, or that we can endure it. Today in the Epistle, St. Paul says, ‘I pray that you won’t become discouraged, seeing my sufferings; this echoes what Christ has said, when he prayed that his sufferings would not scandalize the apostles; instead he says, each disciple must take up his cross. That means WE must take up our cross; this does take courage, but it is a courage in which he will be helping us. For Example: We have a very difficult test in school; we feel fear; but we remember to call on the Lord: ‘Jesus, help me, I know that I am not alone in this test. Holy Spirit, enlighten me to do my best, and then what will be will be.’ Then with our courage alive, we begin – one question at a time, not worrying about the outcome, just doing our best. It’s not that the fear is gone, but we haven’t allowed it to overwhelm us; this is courage: going against our fears. Our courage only comes alive, when we feel the pressure. But this is how we can accomplish great things, even if the odds are 300:1 against us. I need to get a job; a friend tells me they might be hiring at a certain company. I drive there, but I’m nervous about going in. What if I don’t get the job? I might feel like a failure if it doesn’t work out. What if I don’t know what to say? So we pray: ‘Lord, help me in what I will do.’ And then we put our feelings aside, we go against our fears, and go in. And we don’t worry about the result. This is to act with courage. St. Paul says, ‘I can do all things in he who strengthens me.’ In other words, if we do things with the Lord, asking him to be with us, we will have the courage we need. ‘But I am often kind of a coward, I don’t have the courage to do things that I should. How do I get courage.’ Well, two things to remember: First, as we have said, we have to pray for it, asking the Lord to give us the strength to do this thing. His grace is important. And the second is: courage is a virtue that grows with practice. 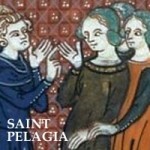 Do we think St. Cecilia only acted with courage for the first time, when she was a martyr? No way! During her time growing up, she certainly practiced doing what was kind of difficult, going against her fears in smaller things. In this way, she developed a habit, an instinct for courage. For this reason we should ‘step-up’ to challenging things even though we have some fear. Then little by little, it gets easier! Some people are very afraid of being embarrassed or of saying the wrong thing. I had a friend in college who was afraid of public speaking in front of big groups of people, but his career would require it. So, going against his fears, he spoke to small groups at first, then bigger groups. By going against his fears, he got used to it, and now is comfortable speaking, but it took acts of courage. If the risk for us is pain, or embarrassment, or failure – so be it. We recall the Lord’s promise: ‘Be strong and courageous, do not be frightened, for the Lord your God is with you wherever you go.’ Josh 1:9 If it is the right thing to do, then we summon up the courage, and just do it – come what may. A woman with great courage was Mary. She agreed to be the Mother of the Savior, having no idea what lay ahead; she just said ‘yes’. Mary, pray for us, that even in our fears, we will have the courage to do what is best, and act always for the glory of God.